Our October meeting guest speaker was Peter Unmack. Peter brought us up to speed on his work with two new species: the Malanda Rainbowfish and the Running River Rainbowfish conservation project, and brought some quality F1 Running River Rainbowfish with him for us to auction off on the night. In the northern rivers of Tasmania, there lives a rare creature, the largest of its kind on Earth. It grows to a nearly metre long and has claws strong enough to crush the bones in a man’s arm. It’s an alien looking beast, covered in thick shiny black armour and for Todd Walsh, it’s one of his two favourite things in the world. 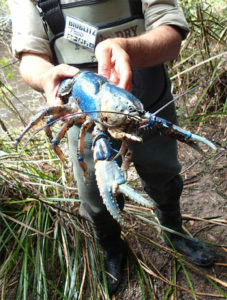 The Giant Freshwater Crayfish Astacopsis gouldi is one of the most exciting animals in Australia yet most people have never heard of it. Todd Walsh was born here and grew up poaching them with his brother as a kid. In 1971, the Advocate, a Tasmanian newspaper, published a photo of his grandfather holding up a specimen almost a metre long and weighing up to three and a half kilograms - maybe the biggest ever caught. Todd’s other love is beer. 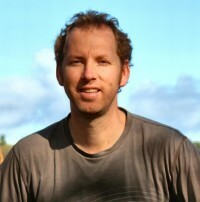 He’s one of a growth band of Australian micro-brewers producing very high quality boutique beers. For Todd, the combination of beer-making and Giant Crayfish has clear synergies. What’s more Tasmanian than beer-making in the crystal cool-flowing waters of the north, where the oversized yabby lives? When the Giant Freshwater Crayfish was protected years ago, Todd turned gamekeeper, offering his skills to find and study them. Even today, he remains the only real expert, the “lobster man” they call him. Four ANGFA members were lucky enough to spend a day with Todd in the field during the Bob Brown Bioblitz of 2016 and were given a rare insight into the lives and habitat of this extraordinary animal. We are very excited to confirm that Todd Walsh is booked in as our guest presenter for our club meeting of 4th August. 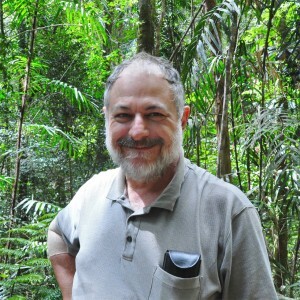 John Lenagan, through two short videos, presented his adventures into West Papua and the Raja Ampat districts where he explored pristine habitats with Heiko Bleher in 2016. John’s presentation included underwater footage of some of the local Rainbowfishes and many other unique freshwater fishes from Batanta and Waigeo Islands. Typical of John’s presentations, this one incorporated immersive footage which will take us from the surrounding jungle directly into the freshwater habitats where these fishes are found. John’s June presentation will also included some footage of the Coral Reefs of Raja Ampat which have been described as containing some of the most diverse coral habitats in the world. 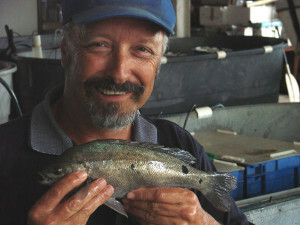 Our presentation for February was given by Tim Curmi about Macquarie Perch. Tim Curmi is a freshwater ecologist and currently is president of Native Fish Australia (Vic). After completing an Aquatic Science degree at Deakin University in the early 1990s, he went on to complete an Honours degree studying native fish ecology through La Trobe University. Since then he had worked for various organisations including La Trobe University Wodonga and the Environment Protection Authority where he carried out river health assessments across Victoria. He is particularly interested in the ecology of and restoration of endangered native fish populations to their former levels, and in engaging and empowering the community in ways to protect and promote native fish and preserve & improve river health. He presented on the work of the NFA hatchery with Macquarie Perch breeding amongst other things. Our first presentation for December was titled "Turtles Australia" and was given by Dylan Hill. turtle including husbandry, identification and threats to our native species. He will also have on display several species from different locations around Australia. The second presentation was titled "Fishes of Kakadu National Park", and was given by Dr Michael Hammer, Curator of Fishes at the NT Museum and Art Gallery. of plants and animals; it’s plunge pools offer refuge from the tropical heat, and the rich indigenous culture of the area is ever apparent. This talk takes a different type of guided tour across the area, focusing on fish diversity at both tourist locations and more remote areas. 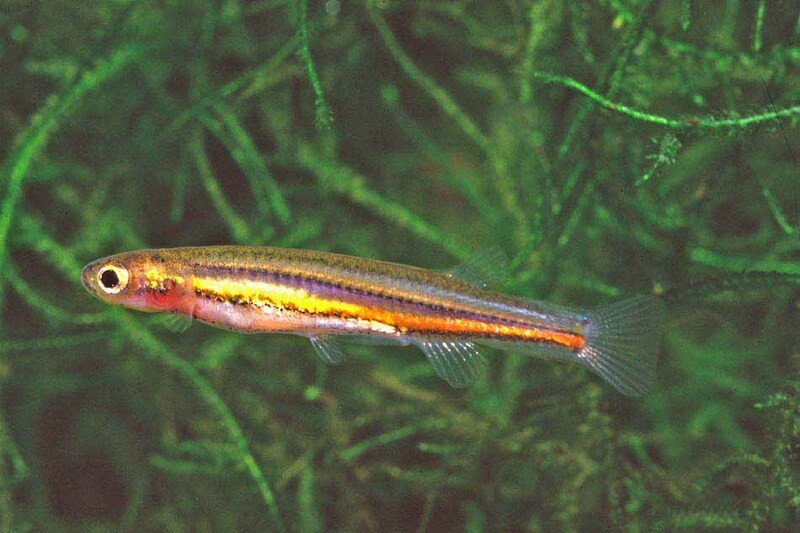 Starting in the estuaries with an encounter with the rare Threadfin Goby Egglestonichthys ulbubunitj,then heading to wetlands, thermal springs and the escarpment as a hotspot of rainbowfish diversity (with plenty of other species in between). Our October main guest speaker was Greg Martin who, together with Phil Littlejohn, volunteered to partake in the 2015 Bob Brown Tarkine Bioblitz representing ANGFA Victoria. This event was held over a 72 hour period in late November last year and was attended by about a hundred scientists, naturalists, and like-minded volunteers from all over Australia. The aim of the Bioblitz was to find and document as many of the animal and plant species present in an area known as the Tarkine wilderness in the far north west of Tasmania. Greg showed us photographs taken during that weekend which illustrate the truly unique qualities of the Tarkine – an area that is so worthy of our enjoyment, understanding and ultimately, our protection. Our mini presentation this October was from three seasoned fish breeders; John Cousins, John Coates and Ross Weber. They drew on many (!!) years of experience to guide us through the ins and outs of successfully breeding Blue-eyes. 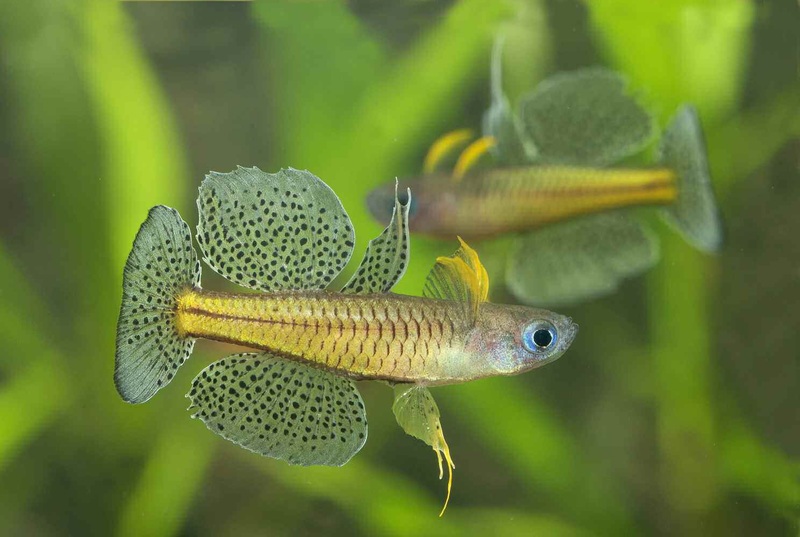 Topics covered on the night were conditioning fish for breeding, appropriate foods, setting up your breeding tank, water parameters and rearing the fry. 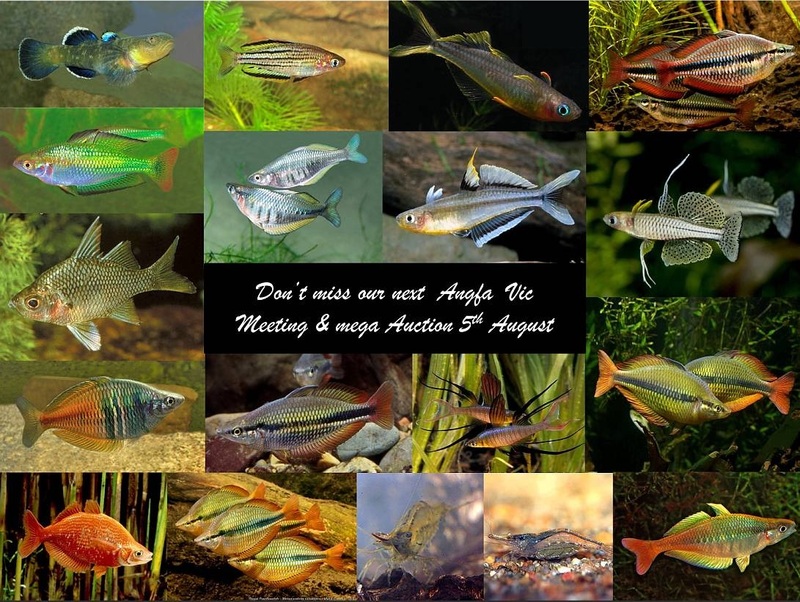 ANGFA Fish Auctions are always a highlight for anyone with a strong interest in aquarium fishes native to Australia and New Guinea. At the August meeting of ANGFA Victoria, we held a mega-auction to celebrate our wonderful array of indigenous aquarium subjects. There was a great representation of aquarium fishes native to Australia and New Guinea, plus even some other items of interest such as various Australian native shrimps and aquatic plants! The auction fulfills several important roles: firstly, as a fund raiser for ANGFA’s publications and conservation funding activities; secondly, to help disperse rare species to keen native fish enthusiasts: this is your best opportunity to source a wide array of Australian/NG fishes and other aquatic species that are rarely (or virtually never) available in the mainstream aquarium hobby. The wide array of species presented was thanks to a network of ANGFA supporters and members from many parts of Australia. For the June meeting we had two very different talks. The first was by Emmaline Bowman. Emmaline’s presentation topic was about the impact of Misgurnus anguillicaudatus or as commonly known, the Oriental Weather Loach. She also touched briefly on the impact of invasive species and how we enable these species to thrive. The second presentation feature members, Gary Moores and Glenn Briggs talking about catching and keeping larger native species. With over 40 years of combined experience keeping many different species of fish one may ask what’s the attraction? Their talk not only concentrated on their husbandry but also on how you can get your hands on different species that are seldom available in local aquariums. 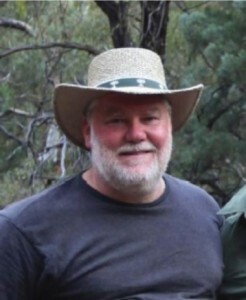 John Lenagan presented highlights from a recent 2015 field trips into Queensland’s far north and Gulf Country. This was a unique presentation revealing footage of many underwater habitats and various encounters with the local native fish. 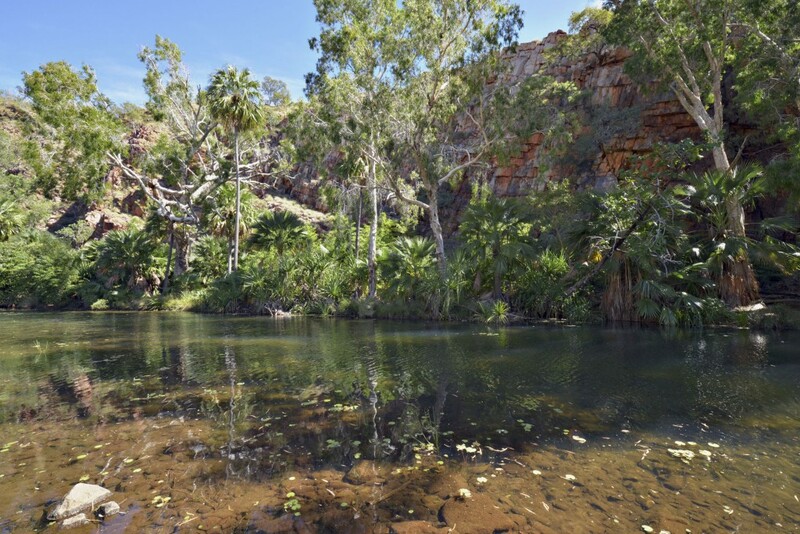 The excursions included a 2,500 km road trip taken with Gary Moores beginning in Townsville and going up through the Gulf and back down through the Simpson Desert to Cooper Creek. Then there was a ten day field trip with Dr Michael Hammer from Cairns to Weipa and back through Cooktown and the Daintree, with many tips on how to stay alive and afloat in the mangroves teeming with “Salties”. Included will be some footage from the many river systems flowing east off the dividing range into the Daintree as compared to those flowing west back into the Mitchell catchment system. 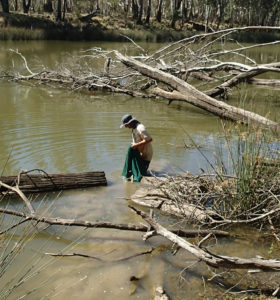 There are over 80 freshwater and estuarine fish identified from the 18 river systems surveyed. The presentation has been compiled from over 12 hours of raw footage into a final 45 minute edited film, capturing the rugged beauty of these remote areas and the few remaining sanctuaries where these resourceful fish are still congregating after a 5-year long drought which has impacted most of Queensland’s far north. Typical of John’s presentations there will be the odd character study of some of the other unique wild life encountered along the way. 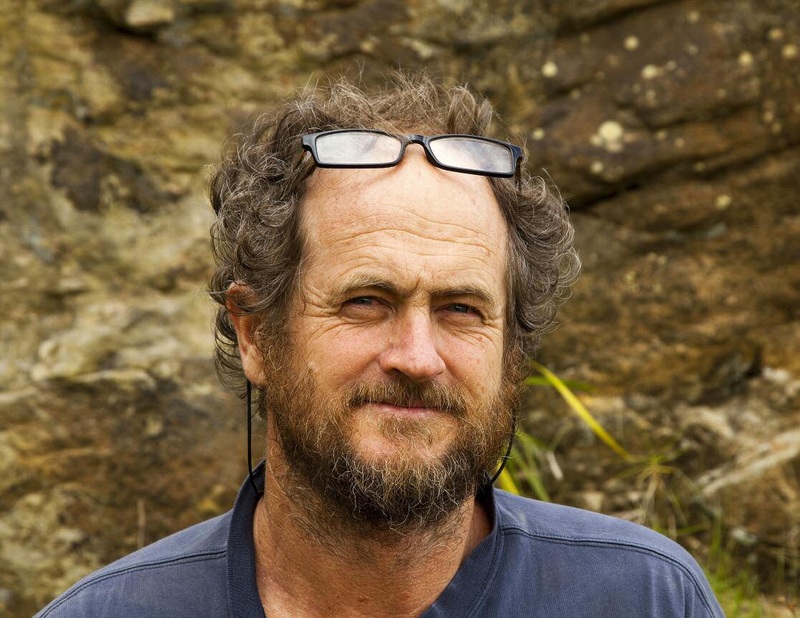 Our February meeting featured a presentation by aquaculturist Bruce Sambell, often called the Perch Man, who is the founder and designer of fish hatchery Ausyfish Pty Ltd, which he built in 1988. 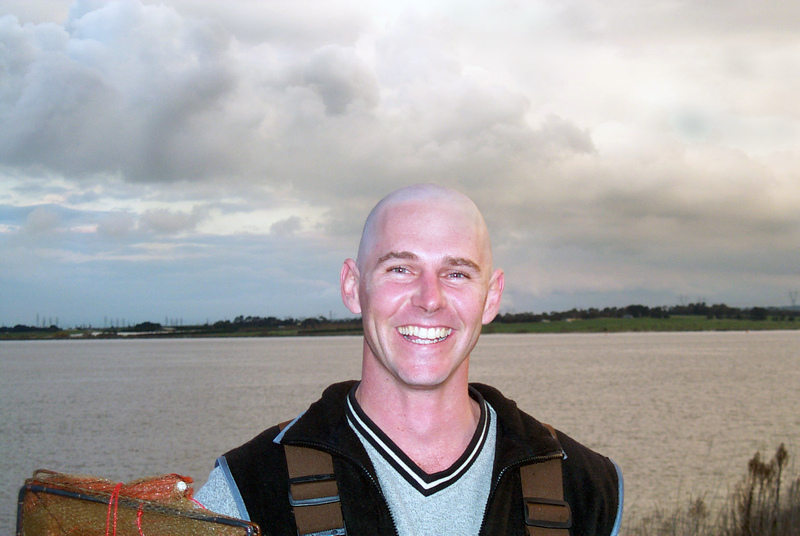 Bruce has been a representative of various QLD aquaculture associations as well as being a Government consultant and adviser. Bruce made an HD video for his presentation to us which covered the coal grunter in aquaculture, from catching the breeders in the bush to rearing the fingerlings, including hormone induction. Also material on commercial production of rainbows. Meet Priya Crawford-Wilson, Waterwatch Co-ordinator, Customer and Strategy Group from Melbourne Water and our December 2015 presenter. 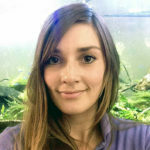 Priya has experience in environmental education and research across a range of areas and has been involved in promoting Raingardens as part of the Melbourne Water healthy waterways initiative for Darebin. Kwai, John Lenagan, Graham Sexton and I have been in the field with Priya and she knows her stuff! 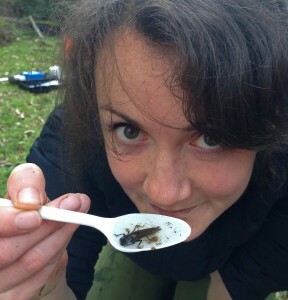 At our December meeting Priya will present a talk on water bugs, covering some common different groups that one is likely to find and the significance of why some species occur in places where others do not and how this can be used to indicate water quality. The Spotted Tree Frog, Litoria spenceri, a frog in crisis. 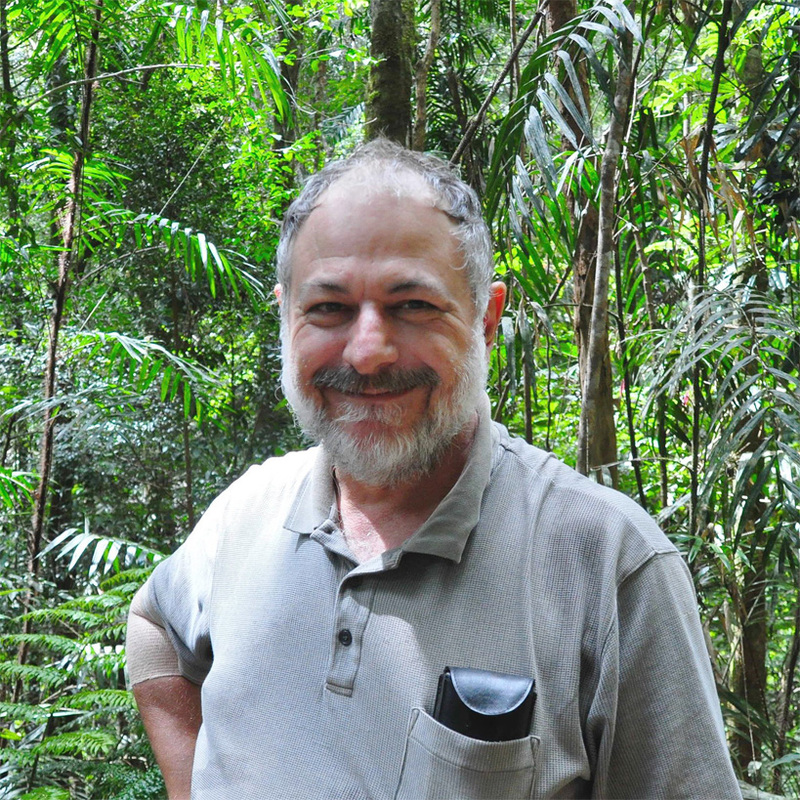 Matt West, our main presenter for the October 2015 club meeting, will talk about his investigation into the roles of introduced fish and disease in the decline of Spotted Tree Frogs. These are one of Australia’s most well studied frog species, now with more than 25 years of targeted research and 55 years of observations. 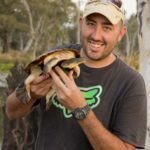 Matt has been conducting mark-recapture and broad scale surveys over the last 7 years building on the extensive research base in order to develop optimal conservation strategies to protect the Spotted Tree Frog. 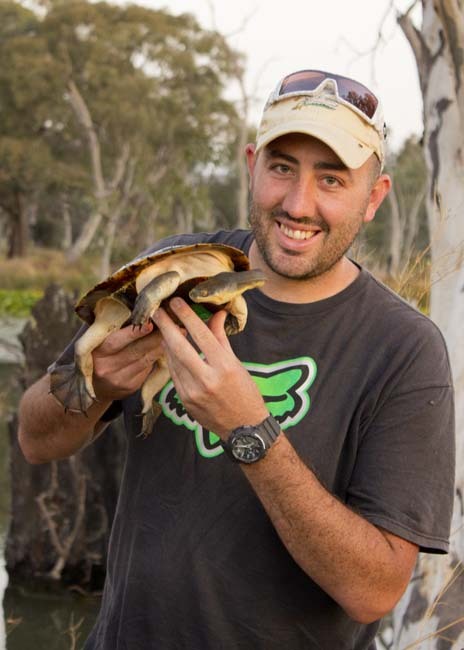 Matt has been working in and studying wildlife management over the last 19 years, including a Masters in Reproductive Biology as well as time spent in private wildlife consulting and at Zoos Victoria managing and breeding threatened species. He is currently completing a PhD on frog declines in the Quantitative and Applied Ecology Group at the School of BioSciences, University of Melbourne. We all keep a few Aussie native aquarium fish, but do we realise just how much choice we have?! There is a native fish for virtually every aquarium – whether it is a 10 litre nano or a 500 litre monster tank. 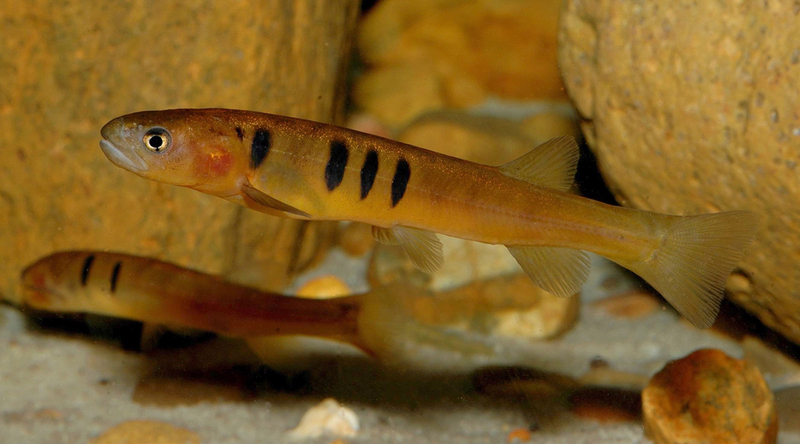 Australian freshwater fishes are not as speciose compared to other (wetter) continents, but we still manage to have some suitable aquarium species which can rival the best in the world. Member, Glenn Briggs presented a kaleidoscope of photographs of Aussie native aquarium fishes, including popular favourites such as the Banded Rainbowfish (Melanotaenia trifasciata), plus various rarely-kept species. Glenn began keeping native aquarium fish as a teenager, by catching and keeping some of the local natives in creeks when he lived in Brisbane back in 1975. Apart from a couple of short fish-free periods, he’s been a fishkeeper ever since, primarily keeping Cichlids and especially Australian and PNG fishes. Glenn has also worked in the aquarium trade for many years, in retail and wholesale, and is currently part of the fish purchasing team at Aquarium Industries. 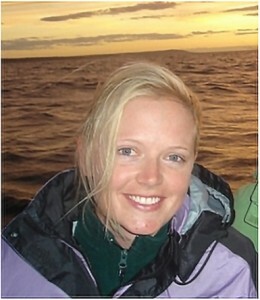 Lauren Veale from Nature Glenelg Trust talked about her work at Long Swamp in the far South-Western corner of Victoria. 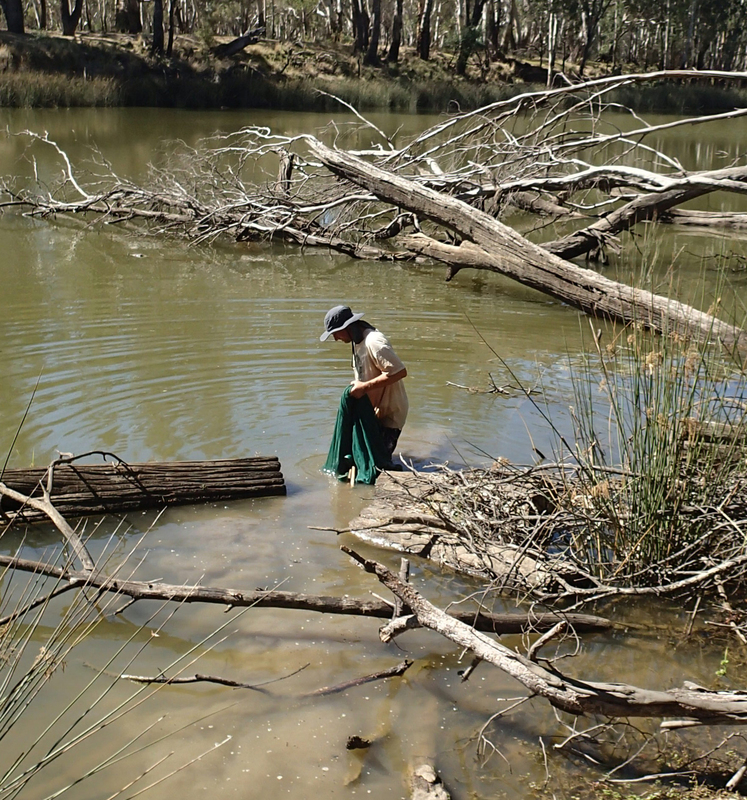 Ecologists Dr. Lachlan Farrington and Dr. Lauren Veale of Nature Glenelg Trust will be talking about their work on the restoration of coastal wetlands in South East South Australia and South Western Victoria including Long Swamp. 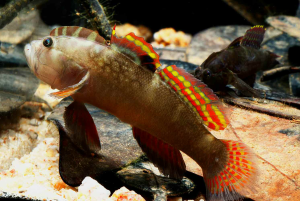 In this April’s ANGFA talk Shane Brooks showcased native Australian shrimp species to explore the diversity of colours, behaviours and breeding that make these such attractive and interesting creatures. 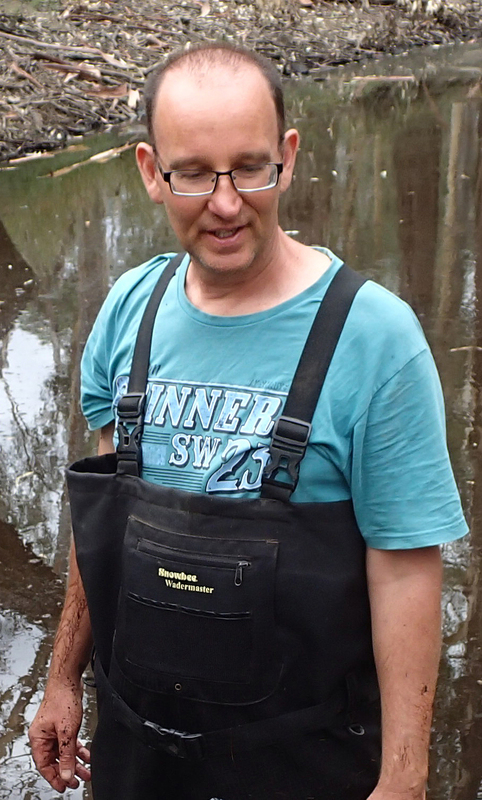 Shane is an aquatic ecologist with a passion for science, sustainable management and river restoration. 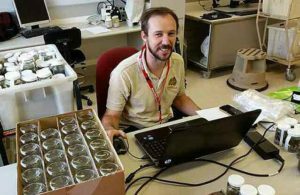 He has a life-long interest in freshwater invertebrates from a childhood spent dabbling in creeks and ponds to a research and consulting career as an aquatic ecologist. For a hobby, Shane keeps and breeds fish, native shrimp and aquatic plants. 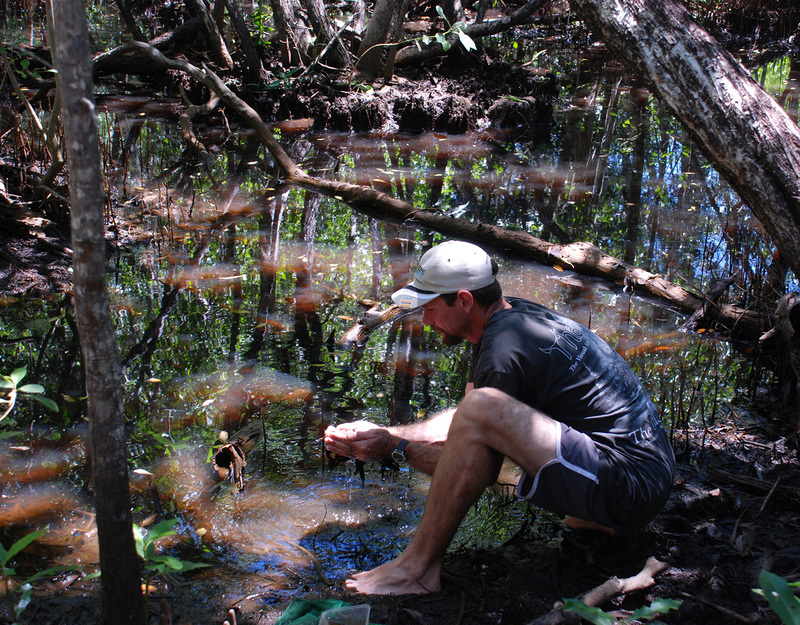 His talk will be a mix of science, natural history, and personal experience from recent shrimp breeding experiments. Planktonic larval stage of the Darwin Algae Shrimp (Caridina sp. NT nilotica). 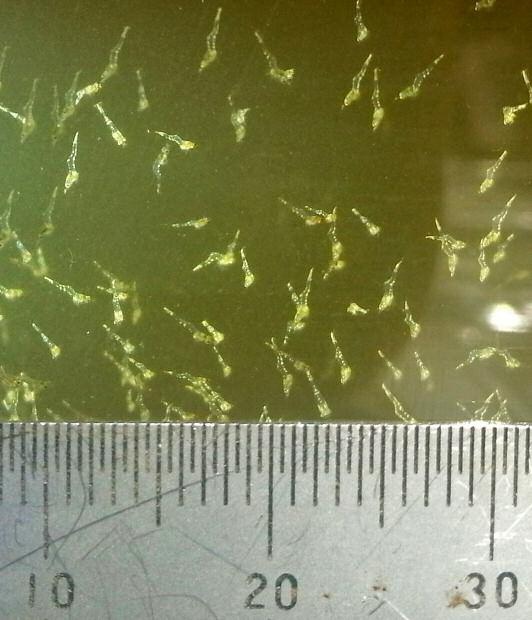 Juvenile shrimp settle and migrate into fresh water. Photo: Shane Brooks. Some native shrimp species breed and complete their life cycle in fresh water and are easily bred in captivity in aquaria. Others live as adults in fresh water, but have planktonic larval stages that develop in estuaries or the ocean. Shane will share his recent experiences of breeding popular native shrimp species that require a marine larval stage. 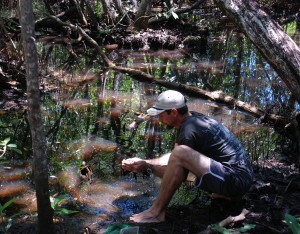 Shane's talk will be a mix of science, natural history, and personal experience from recent shrimp breeding experiments. Underwater Video - A beginner’s guide to filming in the shallows. 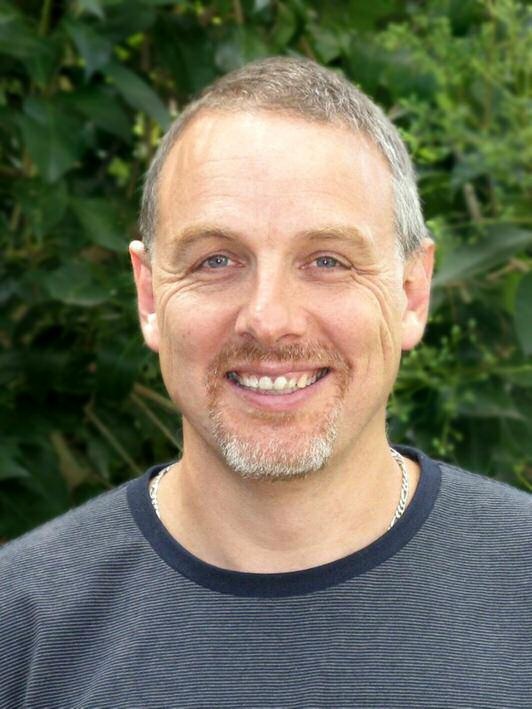 Greg Wallis’ presentation at our February meeting will give an introduction to underwater video for beginners; not from the usual perspective of a scuba diver, but from someone who likes pottering around in the shallows and filming some of our smaller native fishes. Greg will show some of the techniques he uses to film in the shallows (from ankle deep water down to 5m) techniques that only involve wading or snorkelling, and some where you can even keep your feet dry and still get great underwater footage. cheap waterproof cameras, those videos have now moved into the underwater realm. Whilst many of our native freshwater fish have been beautifully photographed and adorn the pages of many guides and books, very little exists in the way of video for most species. Video not only showcases the beauty of the animals, but can also give interesting insights into their behaviour and habitat. Underwater video used to be solely the domain of those with big budgets and expensive cameras but with huge advances in camera technology, the camera is no longer a limitation to quality, and getting great underwater video on a budget is now an option for anyone with a bit of creativity and patience. In addition to showing some videos of local species and some from the Top End, Greg will discuss some of the issues to consider when planning your own video, some ideas for getting great shots, and a brief rundown on editing and uploading your video to the internet to share with other ANGFA members and like-minded people across the world. Whether you are interested in videoing the next ANGFA field trip, your next camping trip away, or your aquariums in the fish room, you are sure to find some useful tips in this talk. John Lenagan, our December guest speaker, presented highlights from his recent trip to South America. From sand bars to flooded forests. 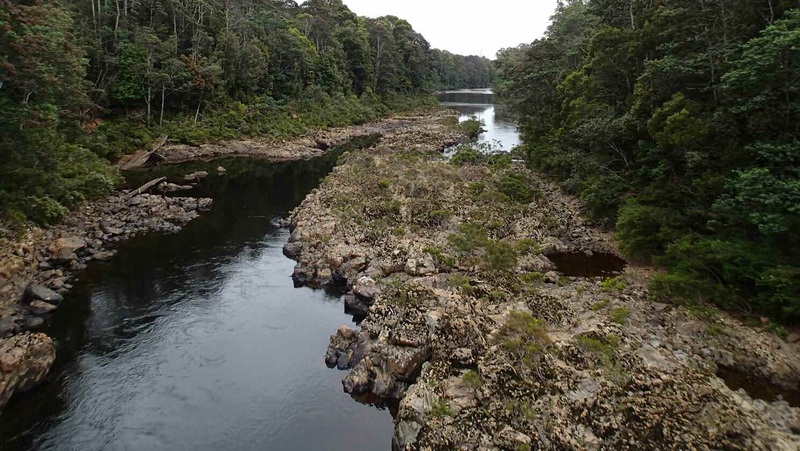 They explored more than 2,000 km of river in those two totally different drainage systems; one South of the Equator and one to the North; catching and photo graphing over 260 species of fish- some undescribed to science. See unique video footage showing the behaviour and habitat of some exotic and well known aquarium fish. John will show us rivers in full flood, some with a pH of only 3.5! 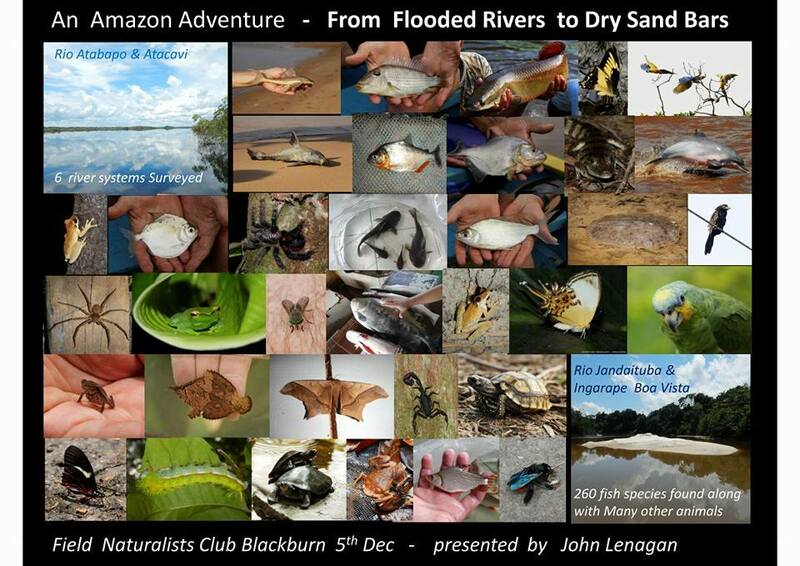 Join John Lenagan as he presents highlights from his expedition with Heiko Bleher down the Rio Jantiatuba in Brazil and Rio Atabapo in Venezuela. This was a great night and the end of another great year for ANGFA Vic! John Mc Guckin talked on the history of the distribution of Galaxiella pusilla. 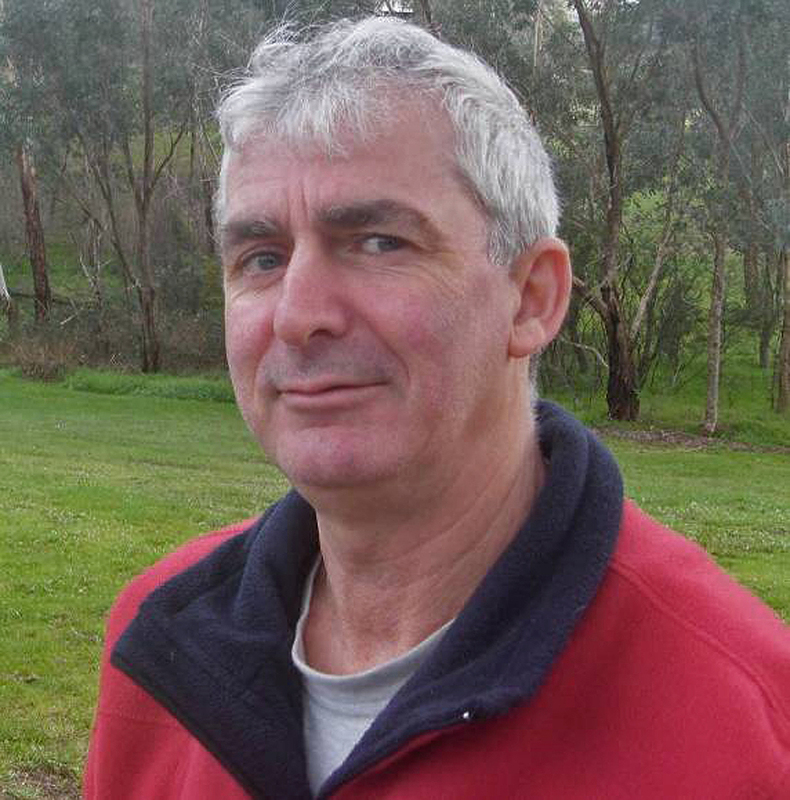 John McGuckin is a limnologist with 30 years’ experience in environmental research. John was a biologist for the Department of Conservation, Victorian Fisheries and the Rural Water Commission prior to starting his own company, Streamline Research in 1995. 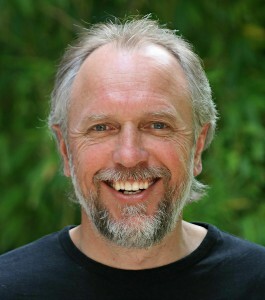 John was the first known fish biologist to set up an environmental consultancy company in Victoria. He has conducted hundreds of projects that have local or regional importance, providing an important niche integrating development projects with government environmental objectives. Initially he was contracted by a number of consortiums including SKM, SMEC, Biosis Research, Ecology Australia, all of which have since employed staff to undertake similar roles to what John performed. He has continued to consult to government organisations inclusive of Melbourne Water, Parks Victoria, DEPI, the various CMA’s across Victoria, VicRoads and local government. He talked about his long term commitment to the protection of the nationally threatened dwarf galaxias (Galaxiella pusilla) in the Hallam area. His talk provided members with an update of progress following on from ANGFA’s past involvement in the preservation of the species; the ‘Beginning of a Sanctuary’ (ANGFA NEWS Issue No.25) and the ‘Conservation of Galaxiella pusilla re-visited’ (ANGFA NEWS Issue No.44). 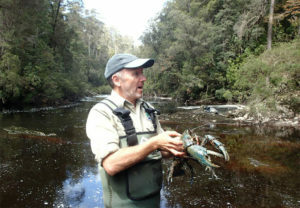 John also outlined exciting new plans for the re-introduction of dwarf galaxias into the Dandenong Creek valley. Our Guest speaker for the August meeting was Tarmo Raadik. Tarmo is an aquatic biologist and taxonomist with 25 years’ experience in the management and biological research of aquatic fauna. 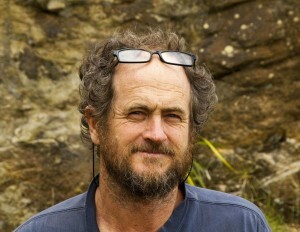 He is well respected for his extensive knowledge on alien and native aquatic fauna distribution in south-eastern Australia and specialist skills in freshwater and estuarine aquatic fauna community sampling, taxonomy, biology, conservation, monitoring, and alien species, with emphasis on fish, decapod crustaceans and bivalve molluscs. Tarmo has also worked extensively in the area of threatened fauna management, particularly on freshwater and estuarine fish and freshwater decapod species. 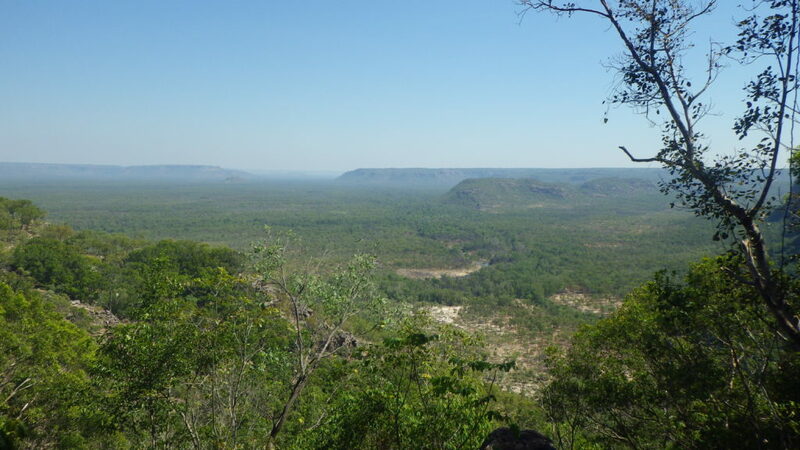 These projects incorporate all areas of conservation management, from verifying the status of declining taxa (population abundance, distribution), defining the issues/threats and potential management actions, to undertaking specific recovery actions. 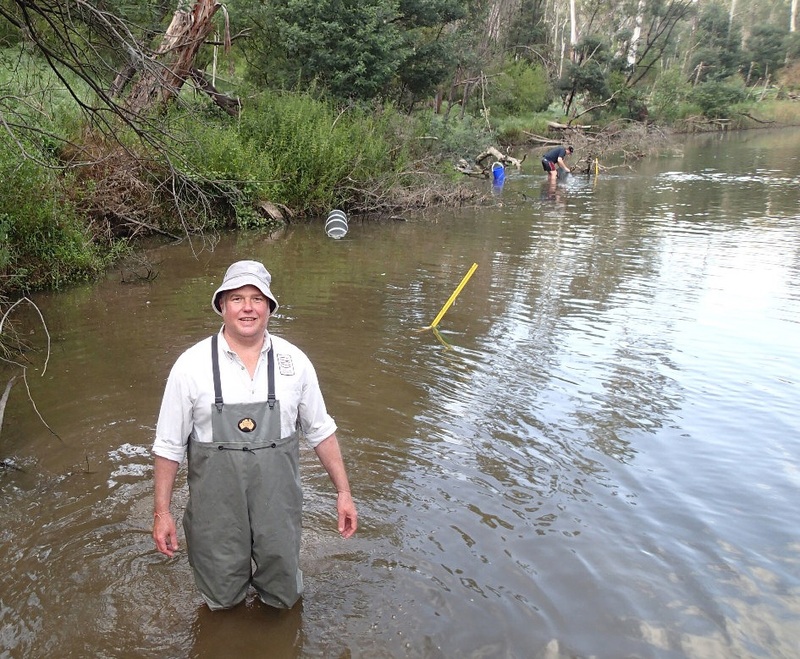 Tarmo has written over 80 scientific publications and recently completed a PhD on the systematic revision of a freshwater native fish species complex in south-eastern Australia. His talk wass entitled: Unravelling the mountain galaxias (Galaxias olidus) species complex and 20 years of conservation management of upland galaxiids - oh why did I even start? Our Guest speakers for the June meeting were Matt and James, ichthyologists from Melbourne University who are doing their Ph.D's cataloguing the Grunters from the Kimberley region (WA) and uncovering the ecology of these fishes so that their risk of extinction can be assessed. This was the first time these guys have been available to speak at an ANGFA meeting about their ongoing work. Our speaker for the April meeting was Dr Kathryn Hassell who is a fish biologist at the Centre for Aquatic Pollution Identification and Management (CAPIM) at the University of Melbourne. She spoke about the Eastern blue spot goby, (Pseudogobius sp.) a small estuarine species which is proving valuable in the area of environmental monitoring and pollution research. She talked about the what has been learnt about their early life development and differences in observations between wild caught specimens. It was an interesting talk. For the February meeting Glynn Aland will be flying in to Melbourne (from Queensland?) to give two talks on the fishes and Crustaceans and Shrimps of the Australian Islands in Torres Strait which lies between Cape York and Papua New Guinea (e.g. Moa Island). 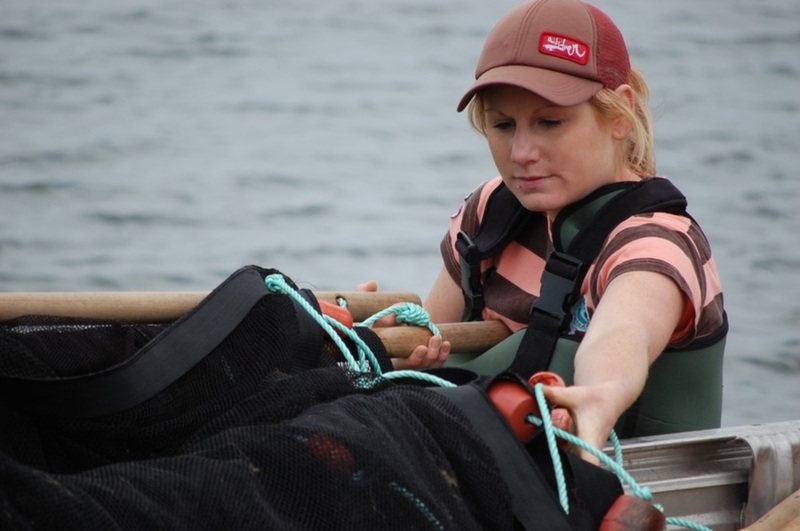 Glynn has worked in many roles for the Queensland Department of Primary Industries; fisheries biologist, fisheries technician and fisheries officer, and has surveyed fish in these roles from the Gulf of Carpentaria to the Gold Coast Hinterland. What happened at our meeting on 6 Dec 2013? 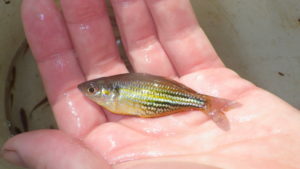 Keith Martin’s presentation in our December meeting provided a summary of recent rainbowfish research findings in the region, particularly in relation to Cairnsichthys, Melanotaenia trifasciata and Melanotaenia maccullochi. The talk also showcased some of the other interesting and unusual fishes of the region, and the landscapes in which they occur.